As attendance is by application-only, Ai4 Finance draws an executive crowd from the industry's leading organizations to explore the impact of AI on FSI. BROOKLYN, NY, UNITED STATES, August 14, 2018 /EINPresswire.com/ — Some fear that the terminators will enslave humankind, while others excitedly anticipate the coming techno-utopia that AI will usher in. Where ever you sit on the spectrum of AI belief, know that artificial intelligence is being used this very moment to create massive amounts of business value. In just the past few years, companies both large and small have entered into a mad dash to infuse machine learning strategies into their work. The ability of computers to draw insights from vast amounts of data that we humans can then act on is quickly defining the coming era of corporate growth. In order to spur the adoption of AI, the Ai4 Finance Conference is an application-only gathering of business leaders, data practitioners, and AI pioneers aimed at figuring out what artificial intelligence actually means to the finance industry. Attendees include senior leaders from top institutional banks, asset managers, insurance providers and credit card companies. Thanks to the convergence of modern computing power and data science, the financial services industry is leveraging AI to create entirely new value. Applications for the 2018 conference have closed. You can still sign up at this application link to receive updates for Ai4 Finance 2019. Common AI applications for the financial services industry include alternative data for investing, cybersecurity, loan & insurance underwriting, chatbots, ML algorithmic trading, robo-advisors, fraud detection, credit scoring, and compliance. Financial institutions are making use of artificial intelligence at every level, causing company-wide changes in internal operations, investment decisions, and consumer products. 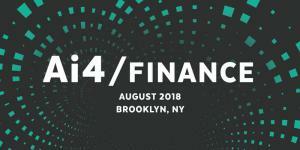 Ai4 Finance is part of the larger Ai4 Conference Series which organizes application-only & industry-specific conferences centered around AI applications. The next conference will be Ai4 Healthcare (ai4.io/healthcare) on November 13th. The organizers behind Ai4 have also convened tens of thousands of people for the future festival known as Worlds Fair Nano.